Jeremy Clarkson: what would they have done with him in Classical Athens? Jeremy Clarkson has just been sacked from his job as a presenter on the BBC’s Top Gear. (This is a hugely popular programme about cars with a vast national and global audience. As an export and saleable format, it makes a lot of money for the BBC, not to mention its well-paid presenters). For the uninitiated, Clarkson had been suspended by the corporation while it investigated an incident which occurred at a North Yorkshire hotel earlier this month. Clarkson and his Top Gear colleagues were staying at the hotel after a day of filming. The investigation has now found that Clarkson lost his temper on arriving at the hotel to discover that hot food was no longer being served. Apparently, he wanted steak and chips. He blamed one of the show’s producers Oisin Tymon for not arranging a meal. He loudly harangued Tymon for many minutes using derogatory and abusive language and threatened to have him sacked. Clarkson also punched Tymon in the face. 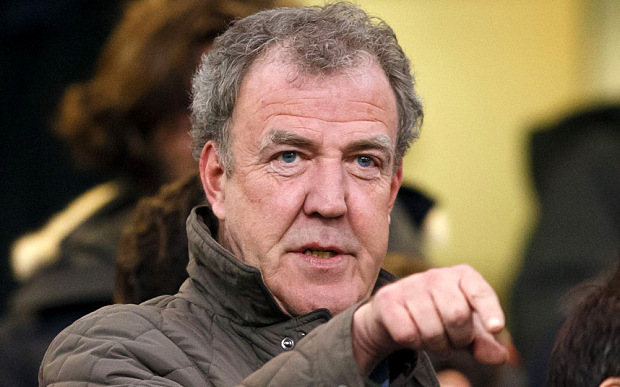 Clarkson himself reported the so-called ‘fracas’ to senior BBC executives. If you don’t live in the UK or follow Clarkson’s antics, you also need to know that he was on a final warning from his employers due to previous on-camera comments using racist language or ethnic or national stereotyping. Both he and his show have polarized audience reaction between fans who are prepared to sign petitions demanding that Clarkson be re-instated and those of us who cannot abide the man. It’s a hard one to answer straightforwardly on account of the fact that democratic Athens did not have flagship television programmes about motoring, but I do think that Clarkson’s behaviour (both admitted and alleged) is ‘good to think with’ for anyone interested in comparing the ancient and modern rhetorics around the excesses of famous and successful men. Now, there are obvious differences between Demosthenes and Mr Tymon. First, Demosthenes was a wealthy, famous and powerful politician operating at the centre of Athenian democratic politics and international diplomacy. Mr Tymon was an unheard-of BBC employee until he had his lip split by Mr Clarkson. Secondly, Demosthenes was not a junior co-worker of Meidias’. Rather, they were both prominent and very wealthy political operators who had held various public offices. Demosthenes claims that the two men had already found themselves at loggerheads over (for example) Demosthenes’ public liability for taxation based on Demosthenes’ private assets (and Medias’ alleged invasion of Demosthenes’ house in connection with it) and in public debates about military policy abroad. There are some ground to suppose that Demosthenes is exaggerating or even fabricating aspects of this back story. However, it does look like Meidias was about ten years older than Demosthenes and that age difference may be important. The way Demosthenes tells it – and we don’t have Meidias’ side of the story – the long-running antipathy between himself and Meidias came to a head when Demosthenes became a chorus-producer of a men’s dithyrambic chorus at the Dionysia festival of 348. 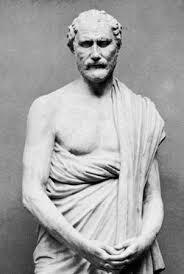 ‘Ooh!’ perhaps you cry, excitedly, before adding: ‘Demosthenes was a producer when he got punched and so was Oisin Tymon! Uncanny!’ Well, yes, but it’s really not the same thing, I’m afraid. Being a ‘chorus-producer’ (chorēgos) in the theatrical festivals at Athens meant that you were very rich and periodically required (but often volunteered) to organize and fund the training, costuming and maintenance of a dithyrambic, tragic or comic chorus. It involved considerable financial outlay, especially if you wanted to make sure you got the best training staff, facilities and costumes with a view to actually winning. A dithyrambic chorus was fifty-strong, so when Demosthenes tells us in his speech that he provided his chorus with special robes and gold crowns, he’s telling us that he put a lot of Wonga into the production. But if the chorus you had funded won its category of contest, it boosted your public profile and standing enormously. We know that winning chorus-producers of Dithyramb received tripods as prizes and these were set up on permanent monuments to remind everyone of the victory. A young Pericles was the chorus-producer for the tetralogy which included Aeschylus’ Persians in 472 BC and we know how successful he became. (For more on all of this, and much more besides, see the wonderful work of Peter Wilson). Demosthenes claims that Meidias was out to sabotage Demosthenes’ efforts with the chorus from the start. He tried to destroy the gold crowns when they were still in the goldsmith’s shop, he bribed the chorus trainer to do a bad job (and the piper had to step in to prevent disaster), he intimidated the judges of the contest…the list goes on. On the day of the performance itself, it seems that the sight of Demosthenes strutting around the auditorium in his fine, official, chorus-producer’s robes was too much for Meidias and he punched him in full view of thousands of spectators. Perhaps, in reality, Meidias and Demosthenes bumped into each other in a crowded aisle and Demosthenes said something rude to provoke his rival. But Demosthenes’ speech cleverly constructs a very different reality. For a start, Demosthenes makes quite a fuss of the fact that, although it would have been excusable to hit Meidias back, and he was certainly capable of doing so, he showed self-restraint out of respect for law, order and democratic processes of dispute-settlement instead. And in order to prevent the impression that this was just an intra-elite spat of little wider public interest, Demosthenes paints Meidias’ assault on him as a symptom of Meidias’ more fundamental, ongoing and politically-charged hubris. Because of his wealth, power and high status, Meidias believes himself to be above the law. Both this and other acts of violence and self-assertion against fellow-citizens are signs of his contempt for ordinary people and their dignity. Demosthenes oscillates between representing himself as just an ordinary member of ‘the people’ and conceding his elite status in order to explain why he is able to, and must, stand up to the bully Meidias when others dared not do so. Demosthenes’ further point is that Meidias and his ilk are ultimately anti-democratic in their attitude and thus need to be made an example of. Now one might ask whether the HSBC bank and its tax-avoiding clients or the CEOs and shareholders of tax-avoiding multinational companies who exploit their low-paid workers are not a more appropriate focus for this sort of public forensic outrage than the likes of Jeremy Clarkson. But Demosthenes’ speech – for all its self-aggrandizing motives – makes a very compelling case for seeing Clarkson’s physical and verbal abuse as more than just a clear breach of ‘good practice at work’. Demosthenes reminds us that Clarkson’s outburst was more than just the sign of a quick temper or a certain boorishness. Rather, it also showed contemptuous disregard for the fundamental dignity of the person whom it targeted. That dignity is rooted in, and should be guaranteed by, the principles and rights of democratic citizenship and equality under the law. Demosthenes reminds us that it is very dangerous politically to condone or turn a blind eye to Clarksonian nonsense. So, Demosthenes would doubtless approve of the BBC’s decision to sack Clarkson for his ‘unprovoked physical attack’. But I think he would also be puzzled by the way in which the incident has very much been debated as a question of ‘what is acceptable behaviour in the workplace’ or ‘what celebrity talent can get away with’. He would think that what Clarkson did was (or could be easily represented as) the mark of someone who believed he was superior to most other people and that this was a sure sign of a certain undemocratic and pro-oligarchic sensibility. Not to mention that unprovoked assault is against the law. Athens was such a punch-uppy sort of place that Demosthenes wasn’t sure that he could get Meidias convicted for serious assault, so he seems to have brought the charge under the auspices of a law against ‘criminal activity at a festival’. Will Clarkson be charged now? I can hear Demosthenes’ ghost rehearsing his prosecution speech already. This entry was posted in General on 25 March, 2015 by Jon Hesk. Hemlock!! Big glass for big motormouth.